Wat a beautiful family:) Touchwood! 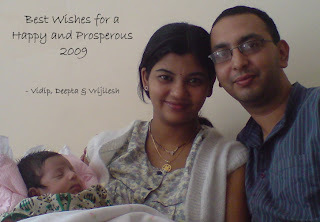 Wish u n ur family a Very Happy n Joyous 2009! Thanx a ton and wish U a very happy New year too! HAPPY NEW YEAR TO ALL THREE OF YOU! Wishing peace & prosper 2009.
hny to u all as well....have a blessed yr guys..
:) have discovered your blog today morning.....and looks like I will be hooked here. hey there's something waiting for u on my blog. So do drop by.